The backlash against globalization is about to become more than just an abstract theoretical exercise for anyone with money in the stock market. 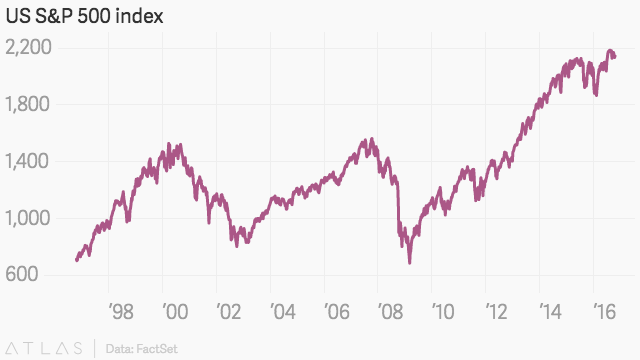 For decades, stocks have had a “globalization premium” that boosted their prices. Now the slowdown in global trade and rise of protectionist policies could cut into expectations for future corporate earnings, dealing the stock market a nasty wallop. According to Barings, a money manager with more than $284 billion in assets, US stocks have traded with a price/earnings ratio—a measure of how expensive the stock is—one whole number higher when free trade agreements are increasing. Barings is now considering reducing or even eliminating that premium in its estimates, according to the Wall Street Journal reported (paywall). At the same time, Barings is shifting investments from stocks to bonds that might be less vulnerable to the impact of trade barriers. “We believe globalization has probably reached its peak,” Marino Valensise, head of the multi-asset team at Barings, told the Journal. The data backs him up. 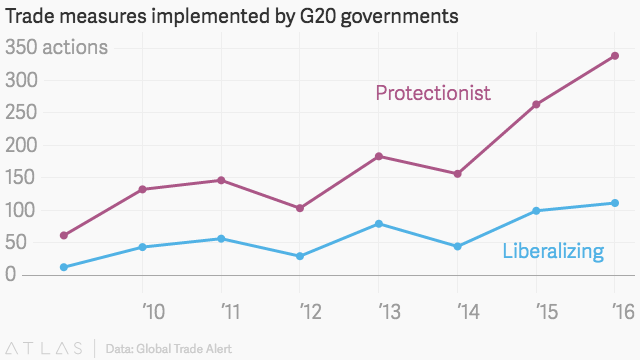 Trade growth will drop to its slowest pace since the financial crisis this year, according to the World Trade Organization, and there are five times as many protectionist measures in 2016 than there were seven years ago. Deutsche Bank strategists are forecasting a rise in global tariffs while both Hillary Clinton and Donald Trump oppose the Trans-Pacific Partnership trade agreement. The United States is not even the most vulnerable to slowing globalisation: About 30% of S&P 500 revenue comes from overseas, compared with more than three-quarters of the revenue from Germany’s DAX and the UK’s FTSE 100. For Keon, this means the US could be a relatively better investment than the rest of the world as global trade rolls backwards. “If global trade was abolished it would be problematic in the United States but it’d be disastrous in Germany,” he said.